Metric Halo's plug-ins have a large and enthusiastic following among Mac users. Can they conquer the Windows world too? Metric Halo are well established in Mac hardware and software, but until now, their products have been off limits to Windows users. MH's audio interfaces remain Mac-only, but they have ported their Production Bundle plug-ins to Windows, albeit in Pro Tools-only AAX format. AAX is also supported on Mac OS, along with Audio Units, and the bundle is authorised to an iLok dongle. Together, the seven plug-ins in the bundle cover most of the basic tasks involved in mixing: EQ and compression, multi-band compression and expansion, de-essing, transient shaping and reverb, plus the intriguing Character, of which more anon. Most of the Metric Halo plug-ins feature optional metering windows that appear to the right of the main interface. Here is Channel Strip 3 in all its glory! Conventional compression and dynamics are provided courtesy of Metric Halo's Channel Strip 3. 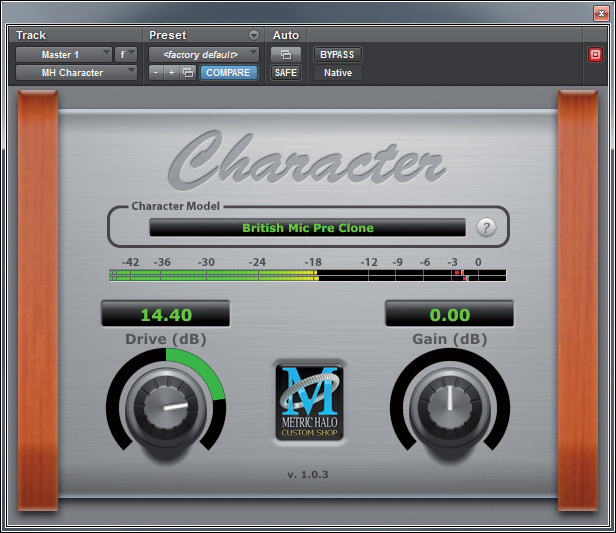 This is the latest refinement of a plug-in that has a very long pedigree in the Pro Tools world, and it's bristling with features: gate, compressor, six-band equaliser, master level control, limiter, a short delay for time-alignment purposes and a polarity switch, not to mention comprehensive metering derived from MH's equally celebrated SpectraFoo suite. Pretty much anything you could conceivably want to meter or side-chain can be metered and side-chained, and the user interface is clean and clear, if rather heavy on the knobs. When the original version of this plug-in was launched, some 14 years ago, the idea of incorporating so many functions into a single plug-in was relatively unknown. The price of Metric Halo's success in pushing the concept is that this isn't true any more, and hasn't been true for quite a while. Not only are there innumerable rival channel-strip plug-ins on the market, but Pro Tools itself now ships with a very capable — and free — Channel Strip plug-in derived from the Euphonix System 5 console. What does Metric Halo's offering have that makes it worth shelling out the extra for another channel strip? For many Pro Tools users, of course, one answer will be backwards compatibility. Lots of people have come to rely on earlier versions of Channel Strip in their TDM and HD rigs, and according to Metric Halo, settings from those earlier versions will open perfectly in Channel Strip 3, allowing older projects to be brought painlessly into the AAX-only future that is Pro Tools 11. Not having any older versions myself, I wasn't able to test this. It's also reasonable to point out that few other channel-strip plug-ins boast quite such a comprehensive list of features. The limiter makes it a one-stop option for the master bus as well as individual channels, and I like the inclusion of a simple delay. Most delay plug-ins are set up by default to provide slap, ping-pong or other effect-type contributions, and when you just want to delay a channel by a couple of milliseconds to alleviate a phase problem, the ability to do it with one control is welcome. 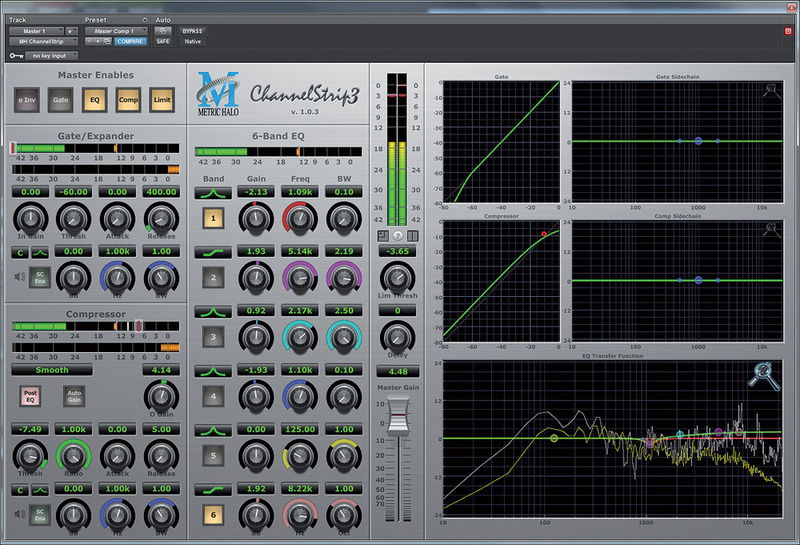 Not everyone will find these compelling reasons to own it, but the sound of Channel Strip 3 is impeccably clean, and if you are convinced you need more than is offered in Pro Tools' bundled plug-ins, it's well worth a try. One area where Pro Tools' suite of bundled processors is still lacking is multi-band dynamics. The Metric Halo Production Bundle includes not one but two plug-ins to fill this gap. Multiband Dynamics is a pretty conventional three-band compressor: each band has its own time constants, threshold, ratio and knee controls, plus make-up gain that can be set manually or automatically. The crossover points are freely adjustable, and there's also a post-compressor limiter in case your mixes need to be made even louder! Once again, visual feedback is very thorough, independent transfer curves being provided for each band and a spectral display showing the overall effect. 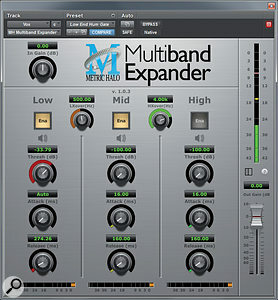 Multiband Expander, meanwhile, employs the same basic three-band architecture, with similar visuals, but is unusual in being dedicated only to expansion rather than compression. Multiband Dynamics is a solid plug-in, which has applications both in mastering and as a channel processor; like any decent multi-band compressor, it's handy for bringing into line boomy acoustic guitars, vocalists who won't stay on the mic, and many other sources. Once again, though, it's operating in a crowded market, and faces stiff competition both from established rivals such as Waves' C4, and 'all in one' multi-band plug-ins like Izotope's Ozone. Metric Halo's implementation is perfectly serviceable, but it does have some limitations, most notably the fact that it has a maximum of three bands. While frequency-specific gating does have its uses — for instance, in reducing hiss or spill in quiet passages — it's hardly an everyday process, and I wonder why Metric Halo felt the need to create a separate plug-in devoted solely to this task. Couldn't the Multiband Dynamics plug-in have been adapted to offer expansion as well as compression? 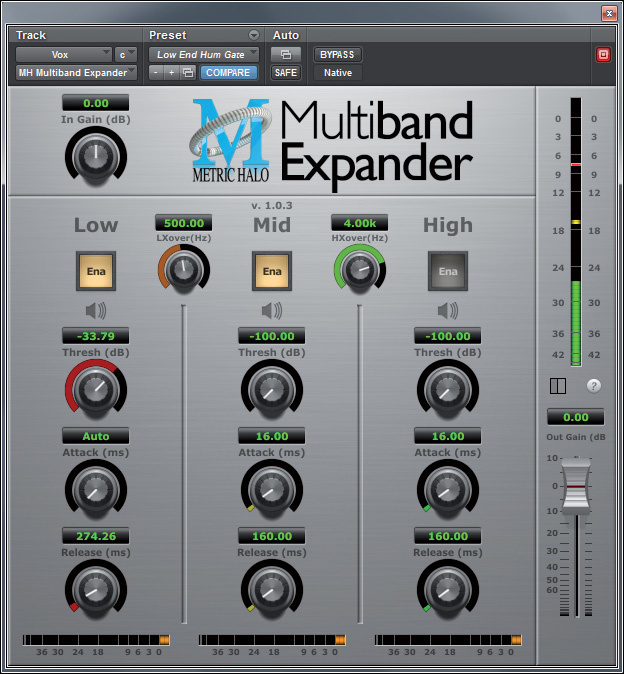 As it is, Multiband Expander lacks the ratio and knee controls of its more familiar sibling, and is thus perhaps less flexible. It, too, is limited to three bands, but works well enough within these restrictions. Any list of useful utility plug-ins would have to incorporate a de-esser, which is why every DAW program I can think of comes with one. However, the Dynamics III De-esser that is bundled with Pro Tools is fairly basic, so there is a good argument for augmenting it with a more flexible third-party option. 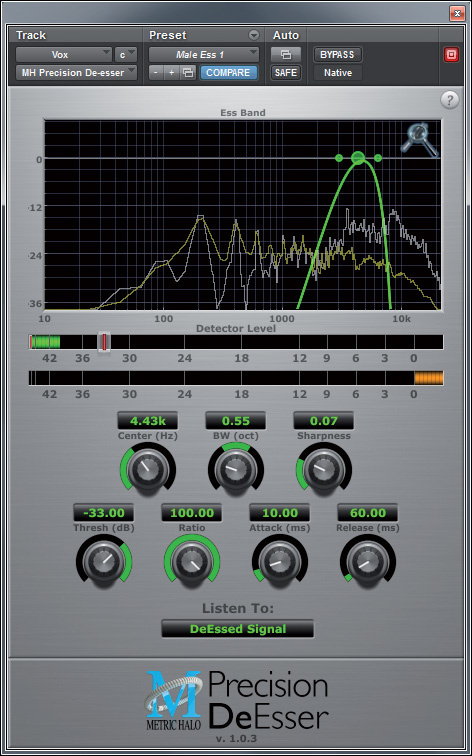 Metric Halo's De-esser is certainly better featured than the Avid option, including ratio, attack and release controls as well as the means to vary the bandwidth and filter slope that define the problem frequency region. Like the other Metric Halo plug-ins, Precision DeEsser also features a nice FFT display. That said, the Metric Halo de-esser still seems to be based on the time-honoured principle of frequency-dependent compression, ducking the signal when a burst of energy in the sibilant region is detected. As such, it feels a little old-fashioned when compared with plug-ins like FabFilter's Pro-DS, Eiosis's E2 De-esser and Sonnox's Suppresser, which feature more sophisticated, level-independent sibilant detection and other innovations. The Metric Halo De-esser is a welcome and useful element of the Production Bundle, but considered as an individual plug-in, I'd struggle to justify spending $199£174 on it unless I absolutely had to have an AAX DSP-compatible option. Level-independent transient manipulation, as pioneered by SPL's Transient Designer, is perhaps more of a luxury than a basic processing option, but it's very popular and widely used for all that. So, like their multi-band dynamics, Metric Halo's TransientControl fills a gap in the Pro Tools bundled plug-in library, at least in theory. In practice, I found it rather baffling, because all too often it appears to do nothing at all! 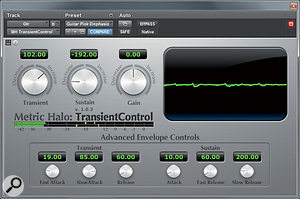 Like most plug-ins of its ilk, TransientControl has separate dials that allow you to exaggerate or attenuate the transient and the sustain portions of the input signal, plus an overall gain knob. The GUI also has two further optional sections: a neat scrolling visualisation of the input signal, and a selection of Advanced Envelope Controls. I tried most settings of these controls, and even with the Transient and Sustain knobs at their extremes, the effect was usually very subtle and sometimes completely inaudible. Other transient-shaping plug-ins worked as expected with the same source tracks, and while it's true that it's an effect you don't want to overdo, I feel this one errs too far in the direction of subtlety. Artificial reverberation is another plug-in folder staple and, again, all DAWs come with at least one reverb. Pro Tools 10 includes no fewer than four, if you count the special-purpose AIR Spring Reverb and Nonlinear Reverb, and even then, its bundled plug-in selection doesn't feature a convolution reverb. At first glance, it looks as though Metric Halo's HaloVerb, with its waveform display labelled Reverb Impulse, is intended to fill this hole. It turns out, though, that HaloVerb is an algorithmic reverb rather than a convolution plug-in, and that this display simply provides a graphical representation of your parameter settings. Said parameter set is rather basic, consisting of low- and high-frequency filters plus pre-delay, RT60 (reverb time), damping, diffusion and stereo width controls. As such, you could be forgiven for wondering whether HaloVerb is likely to offer much of an improvement over the bundled AIR Reverb, but its raison d'être becomes more apparent when you consider that it was originally developed as part of the suite of effects and processors that come with some Metric Halo audio interfaces. 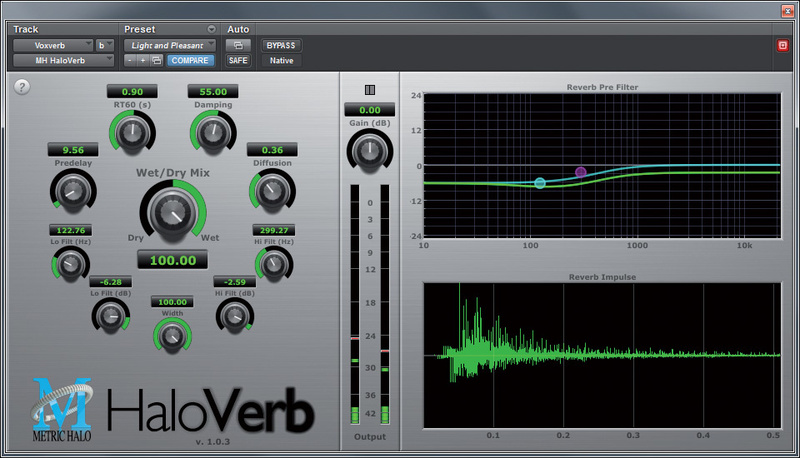 Running on internal DSP rather than the host computer, these effects are designed primarily for cue mixing, so the point of HaloVerb is to provide a simple yet versatile and DSP-efficient reverb that can easily be set up to provide comfort reverb for a performer. 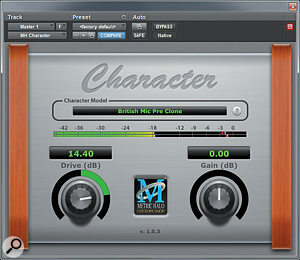 In this role it works well; although you might well want to employ something more sophisticated and more flexible at the mix, HaloVerb lets you find an acceptable sound fast, and is one of very few reverb plug-ins that is available in the AAX DSP format, making it ideally suited to a tracking role in a Pro Tools HD rig. For my money, the most interesting of the seven plug-ins in the Production Bundle is Character. This, too, has its origins in the software that accompanies Metric Halo interfaces, and its aim is to impart that mysterious quality known as 'analogue warmth'. Character is simplicity itself to use: you just choose a Character Model from a list of more than 20 devices, and adjust Drive and Gain controls to taste. Depending on the model and the amount of drive applied, the results vary from the almost inaudible, through the noticeably coloured, sometimes into obvious saturation, but for the most part, this is a plug-in that's very much about warmth rather than fuzz. The names have been changed to protect the innocent, but the range of gear that's modelled in Character is diverse, and includes valve mics and preamps, valve EQs, desks, transformers and more. The result is a pretty comprehensive array of options for massaging your cold and clinical digital sources. Usually, the main problem I had was deciding which model I liked best, and I sometimes even found myself using two instances of Character in series, particularly on instruments such as bass guitar, which seem to welcome this sort of processing. It's refreshingly simple and very effective indeed! Plug-in developers face a continuous challenge in keeping ahead of the competition. Even when you're first off the block with a new idea, you can bet that within a year or two, similar processors will be turning up as freeware or bundled with DAWs. More established products, meanwhile, have to keep existing users happy while competing for new custom with rivals using the latest and most fashionable ideas in GUI design. Metric Halo are certainly keeping up with the times in Pro Tools compatibility terms, as the entire Production Bundle supports both AAX Native and DSP formats. Uptake for the latter format is still relatively low, so if you need the guaranteed DSP resources and minimal latency for tracking that AAX DSP plug-ins give, your choice of channel strips, de-essers, reverbs and so on is fairly limited. If you already use earlier Metric Halo plug-ins in a TDM or HD rig, it makes obvious sense to upgrade to the latest versions. For new users and those who don't need AAX DSP support, though, the equation looks a little less convincing. There are obvious advantages in buying a complete one-stop suite from a single manufacturer, but there are also pluses to shopping around, and frankly, there are other de-essers, reverbs and transient shapers I'd choose ahead of Metric Halo's offerings. Moreover, these plug-ins are not cheap. If you were to buy the Metric Halo Production Bundle alongside a copy of the Pro Tools 10 native software, you'd be nearly doubling your outlay. Doing so would bring an extra touch of class to your plug-in folder, but many will feel that there are more cost-effective ways of enhancing a basic Pro Tools rig. Likewise, I don't know how tempting it will be to Logic users, who get a huge bundle of effects with their DAW of choice for less than the price of a single Metric Halo plug-in. All in all, then, the Metric Halo Production Bundle is neither the most affordable nor the most innovative plug-in collection on the market, but it is undoubtedly a safe choice, with a long pedigree and many existing users around the world. As such, it might not be the obvious choice for hobbyists or bedroom producers, but it will certainly appeal to professional facilities running Pro Tools HDX systems in the worlds of sound for picture, broadcast, and so on, especially as there is no price differential between the native and DSP versions. If you don't need AAX DSP support, there are innumerable alternatives to all the plug-ins in this suite, with the exception that there are few dedicated multi-band expanders (but quite a few generic multi-band plug-ins that can do expansion). For those who do need AAX DSP versions, obvious rivals include McDSP's plug-in range, except that this lacks an algorithmic reverb and a transient shaper, and Sonnox's, though not all of their plug-ins have yet been ported to the new format. A versatile and powerful selection of plug-in processors, with slick user interfaces. Full support for AAX DSP format at no extra cost. Rather expensive, considering that most DAWs include free plug-ins that cover similar ground. 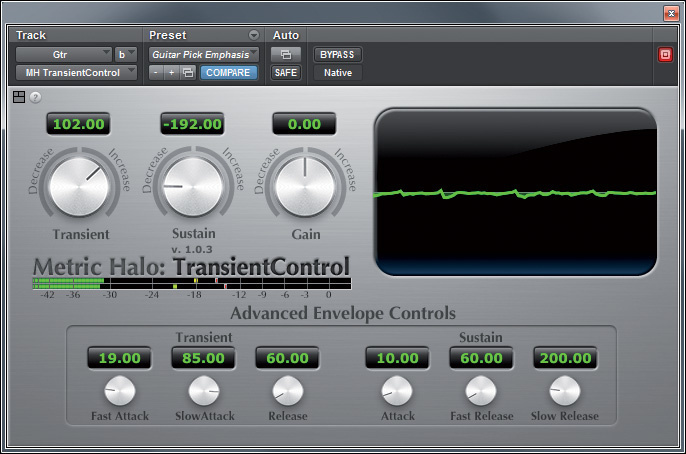 TransientControl plug-in often seems to achieve very little. Although the de-esser and reverb are perfectly OK, many people will find alternatives more effective. Metric Halo's Production Bundle is an established and very solid suite of processors, although it won't be a cost-effective investment for everyone. £600; individual plug-ins £174. Prices include VAT. Metric Halo +1 727 725 9555.